In honor of an upcoming Twin Cities visit by world-renowned chef Francis Mallmann, we provide this selection from his new book. Behold, the power of fire. This is one of the few fresh vegetable salads you can put together all through the winter. It is a favorite at my restaurant in Garzón, even in the summer. Very crunchy, very fresh. The eggs make it a complete light meal. I first had it on a trip to Australia with a number of other chefs, including David Tanis. If you don’t know David, he has had a very interesting life: For many years, he spent half the year as the chef at Chez Panisse and the other half of the year as a private chef in Paris. Now his recipes appear every week in The New York Times Dining section, and they are a highlight of my Wednesday morning reading. 1. Pound 1 tablespoon of the thyme leaves in a mortar until they are bruised and start to form a paste. Whisk in 1 1⁄2 tablespoons of the lemon juice, and then the olive oil. Season to taste with salt and pepper. Set aside. 2. Peel and grate first the golden and then the red beets on the coarse blade of a box grater, keeping the colors separate. Toss the golden beets with the remaining 1 1⁄2 teaspoons lemon juice. Grate the carrots and reserve. Thinly slice the radishes on a mandoline and reserve. 3. Cook the eggs in a saucepan of boiling water for 4 minutes if at sea level, a minute longer if at higher altitude. Run under cold water to cool slightly, then carefully peel off the shells. 4. 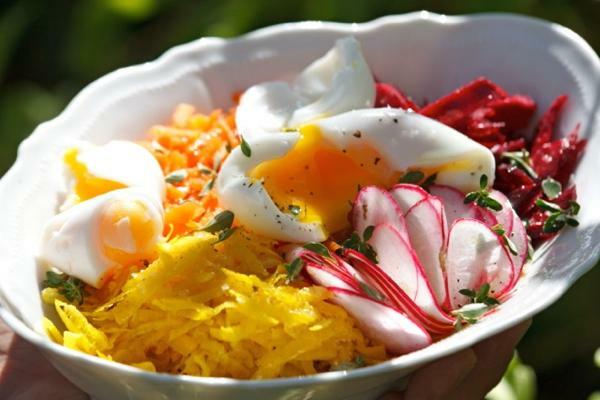 Arrange the grated beets, carrots, and radish slices attractively on a wide platter. Gently tear the soft eggs open and arrange in the center of the platter. Season with salt, pepper, and the remaining 1 1/2 teaspoons thyme leaves. Drizzle with the vinaigrette and serve. 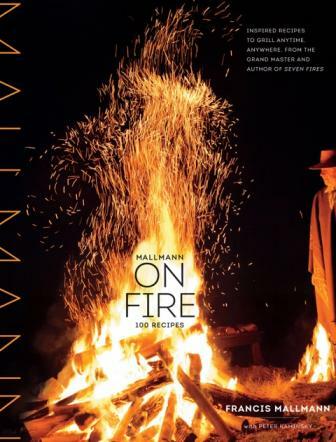 Excerpted from Mallmann on Fire by Francis Mallmann (Artisan Books). Copyright 2014. Photographs by Santiago Soto Monllor. Mallmann will be coming to Cooks of Crocus Hill on October 12th to do a book signing and cooking demonstration. Get your book signed by the fire master!